For those running Windows Home Server, a fellow called “TheWiz” has created a new add-in that works with Microsoft Security Essentials. Very nice add-in, and will come in very handy! Thanks, TheWiz! 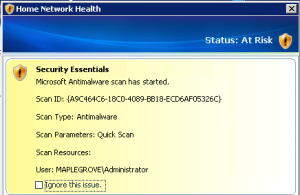 Microsoft Security Essentials Notifier is an Add-In designed for Windows Home Server. Its purpose is to enhance the user experience of those using Microsoft Security Essentials to protect their server. With the new 2.0 beta of Security Essentials running on WHS v1, this Add-In allows you to receive notifications to your client computers of definition updates, scans on your hard disk, and detected malware.